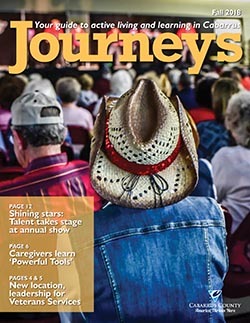 Journeys magazine is your guide to active living and learning in Cabarrus County. Journeys shares the real stories and experiences of locals who are 50-plus. For more information, call 704-920-3484 or email outreach@cabarruscounty.us. Subscribe to get the next issue of Journeys in your inbox before it goes to print. Select on the box below. From the publication site, you can expand the view, share with friends, view other issues and download or print a copy. You do not need to enter your email to view the publication; just select "No Thanks" when it asks for your email. Cabarrus County does not share email addresses with third parties. Link takes you to our hosting service, www.joomag.com. Published monthly, Outlook is your guide to programs and events at the Cabarrus County Senior Centers. Printed copies available at the senior centers the second Tuesday of month prior. Subscribe to get the next issue of Outlook in your inbox before it arrives at the senior centers. Cabarrus County Senior Centers offer free and low-cost health and wellness classes in six-week sessions. Subscribe to get the next Session Guide in your inbox before it arrives at the senior centers.